For most of us, the garage is a multi-purpose room that acts as a storage unit, a workshop, and a place to park the car. But these various uses all require space, and it probably doesn’t take long to fill the garage up and make it difficult to move around or even find the things you’re looking for. To help you get past the clutter dilemma, here are nine ways you can create more space in your garage. Putting similar items together can conserve space as well as making your stuff easier to get to. This could be as simple as putting rags, work gloves and other cloths in a single drawer, or hanging multiple wrenches from a single peg. Similarly, if you have a lot of duplicates that you never need, it might be a good idea to donate some of them or have a yard sale to reduce the clutter. Put your stored items into containers and label them diligently. It will save space to use one container for multiple items, but you need the labels so you can find your things quickly at a later date. Making all those labels sounds like a lot of work, but you will be glad to took the time when the day comes to pull out your Christmas decorations or car parts for that unfinished project. 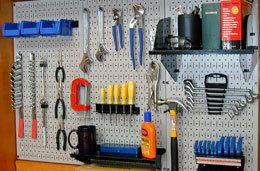 Tools can be stored flush with the walls by installing pegboards and hangers. You can even conserve space a little more by using one hanger for, as an example, a whole set of wrenches. For tools that do not have a hanger hole, you can pick up inexpensive pegboard containers that allow you simply place those tools inside. Cabinets and storage bins can often be stacked, especially if you have them labeled so that you know what is in which location. Keep things that are not used very often on the bottom, and remember that the pyramid shape of your stacks should be pointed upwards to prevent catastrophic landslides of your possessions farther down the line. 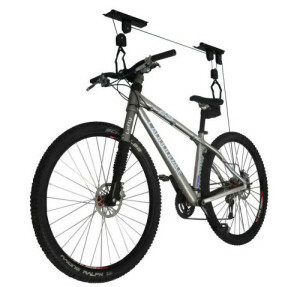 Simple bike racks are two hooks that can be screwed into the ceiling joists, while more complex racks make accessing the bikes easier. In both cases, using the ceiling space in a corner of the garage is a great way to store your bicycles. You’ll get them out of the traffic lanes and make them easy to get to when you need them. For kids bikes that are used daily, you may want to build a simple bike rack that’s on ground level for easy reach. There are many plans online (like this one) where you can build a simple rack out of PVC. You can build or buy a variety of overhead storage racks that give you plenty of room for storing everything from bins to lumber. This gives you the option of using the empty space above your garage doors, in corners, or any wall. It’s possible to easily double or even triple your garage storage area if you have high ceilings to work with. For nails, screws, washers and other fasteners, cut a two-foot section of 2×4 or 4×4 and screw plastic jar lids to the four surfaces. Insert heavy screws in each end of the 4×4 and you can hang it from whatever location works best for you. 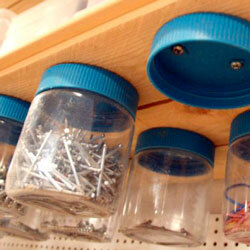 You can then store small items in the jars and simply screw the jar onto its corresponding lid. Be sure to to mount the wood far enough away from wall surfaces to allow it to spin freely. A quick and easy garage hack. Shelves can be mounted on otherwise empty walls. You can either leave a space below the shelves for storage bins, or space shelves out along the entire section of wall. In many garages, storage bins have already occupied the floor area, but the walls above those bins are just waiting for shelves to be installed. Normal workbenches and tables can also be designed to collapse against a wall when not in use, or to serve multiple purposes. If you have a smaller garage and use it for multiple purposes, collapsible workbenches are an essential idea to consider.